The war on globalisation is in full swing… at least, in the developed world. We’ve written lot here about U.S. President Donald Trump’s “Fortress America” approach to global trade – which included launching a trade war with China. And it’s not just the U.S. turning inward. Britain’s vote to exit the European Union similarly signalled a shift inward. Right-wing nationalist parties are on the rise throughout much of Europe. Brazil, the world’s eighth-largest economy, just elected a new president whose style and approach has been compared to that of President Trump. give you a pit-in-the-stomach feel? 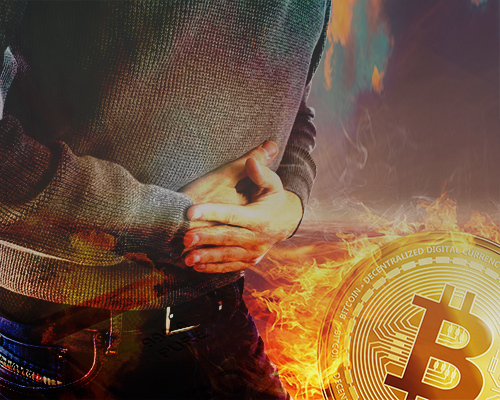 For many investors wild swings in the crypto market can be hard to stomach. While some cryptos shot up 1,318%… 9,162%… and even 36,018% in 2017, the crypto market is down 64% this year. But one crypto trader now found a way to sidestep these nasty declines in the crypto market… and potentially lock in gains like 1,654%… 3,498% and as high as 5,051% on the way up. In short, many developed, western countries view globalisation – and the free flow of trade that comes hand-in-hand with globalisation – as a threat to their future. One easy way to gauge the relative importance of trade to an economy is to look at the total volume of trade relative to GDP (gross domestic product). The more open the economy, the higher the ratio… and as an economy turns inward, trade would likely decline. So with the recent shift away from globalisation by some nations, it’s no surprise that the World Bank shows international trade’s share of global GDP dropped from 61 percent in 2011 to 56 percent in 2016. In the U.S., it’s fallen from 31 percent to 27 percent. Asia has become the posterchild of globalisation in the 21st century, led by China. But no Asian country has embraced globalisation with such intensity as Vietnam. Of the 20 most populous countries in the world, the country with the second-highest figure, Thailand, is far behind with trade making up just 122 percent of GDP. With 93 million people, Vietnam is the 13th most populous country in the world. It has a sizable land area that’s similar to Malaysia, Poland, Italy and the Philippines, making it rich in natural resources. 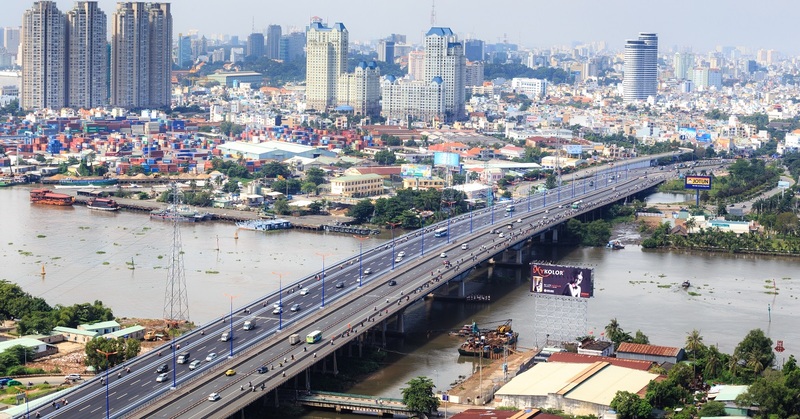 Vietnam is also no longer poor, with a GDP per capita adjusted by purchasing power parity (PPP) of around US$6,700. (For comparison, the U.S. has a GDP per capita of US$59,500… China’s is US$15,300… and India’s is US$7,050.) 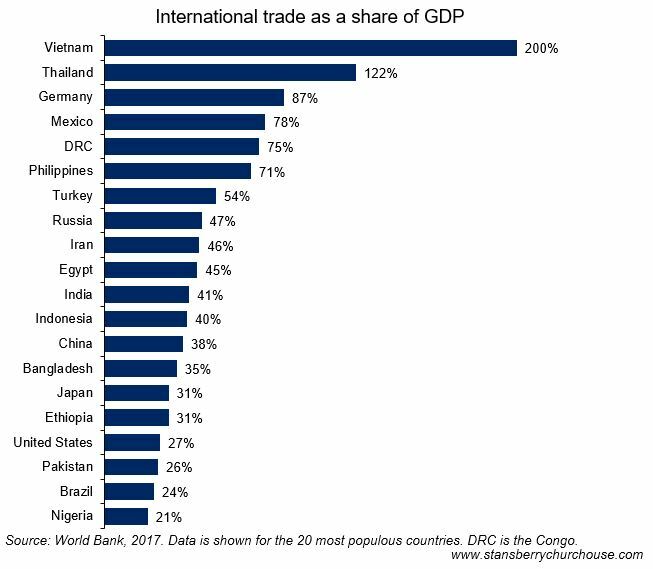 That means Vietnam has a strong domestic market – a lot of people buying a lot of stuff – to supplement international trade as a building block of the economy. So how did Vietnam become the most globalised populous country? By opening up its cheap labour market to foreign investors, Vietnam has become a hub for low-cost manufacturing. With a monthly minimum wage of around US$170, labour costs a bit more than half of what it does in Guangdong province in China. Vietnam makes everything from apparel and shoes to smartphones and cameras. It’s also a leading exporter of high value crops such as coffee, cashews and black pepper. As a result, Vietnam is major exporter to the U.S. and China, and a major importer of machine parts and natural resources from South Korea and China.